With the impending release of NEVER TOO LATE, reviews are popping up in various places, like GoodReads. And, no matter what any of the reviews say about the book, I cannot fully express how awestruck I am with appreciation that people are reading my work...AND taking the time and effort to post reviews. It just happens to be a bonus when readers like my work, even if not wholeheartedly. Look...reviews have been a controversial minefield for years. There's been a lot of news about authors (or their fans) behaving badly over poor reviews. There's been angst over Amazon removing reviews by people connected to an author to avoid review inflation. And, okay, reviews can certainly affect the sales and success of any book. But really, I'm just happy to see people reading. No, not everyone will love NEVER TOO LATE. But I'm hoping some people will be intrigued enough to pick it up. And maybe, just maybe, a few of those people will love it. Even if you don't like it, just read something! The bottom line is...all I have to say, no matter what you think of my book, is thank you. And so we have come to the last Saturday Snippet before the grand release of NEVER TOO LATE! Time certainly does fly! She backed away from him yet again, looking like a frightened doe. When she looked toward the large windows, he suspected she was trying to gauge whether she could safely drop to the ground if she went through one of them. When he reached his hand out to touch her face, he caught the faintest twitch of a grimace and stopped. She looked sad and worn. And he had done this to her. “Every word, every touch, every—” Her voice broke. “It's all corrupted. Every memory is tainted with betrayal—mine as much as yours. It's all ruined, and I can't bear it. I believe it would be best for me to leave now,” she said quietly, barely above a whisper. “I'm afraid I must insist, Lord Devin.” Then he heard it. The barely controlled quavering in her voice. She was broken, and she didn't want him to see how severely. “Listen to me—” he tried again. She brought her eyes to meet his. “Please,” she said. “I beg of you. Just leave me be.” He couldn't ignore how much it cost her. The Nora he had come to know never begged, not even in jest. And he had done this to her. 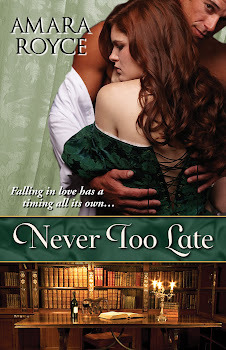 To celebrate the May 2 release of the Never Too Late e-book, I'll be giving away a prize pack that includes a free copy of the e-book, a $25 Amazon gift card, a cameo necklace, and some Never Too Late swag. Details will be announced on May 2, and the giveaway will run May 2 - May 9. I'll be using Rafflecopter, and everyone will have the opportunity to submit multiple entries through Facebook, Twitter, and questions to answer. Come visit and spread the word! I started this blog/site in June of last year, very soon after I began querying agents for NEVER TOO LATE. "Why I set novels in the Victorian Era." First, my sympathies go out to everyone affected by the tragedies in Boston and Texas, as well as victims of the earthquake in China. It's been a rough week for many people, and the heroic efforts we've witnessed help reinforce my faith in humanity. I'm hoping beyond hope that the coming weeks are brighter and calmer and happier for us all. Now...onward to today's Saturday Snippet. There is less than a fortnight until Never Too Late enters the world. Twelve days, to be exact. She made her way toward the back of the house, checking every window for a possible weak point of entry. To no avail. She slipped into the shadows and paused to reassess her plans. Finally, she accepted that she hadn’t been thinking clearly. Surely no one so despicable would make it easy for someone to slip into their lair. They would be stealthy and protective; she needed to think more like them. After some quick thought, she decided to pass herself off as a poor, desperate widow willing to do anything for quick funds. She would simply go up to the front door and beg for employment. She rearranged her clothing to look a bit more disheveled and took a deep steadying breath. Just as she was about to emerge from the shadows, however, a large hand covered her mouth from behind and she was pulled back into a hedge behind the house. Next week, I'll provide more detailed information about my upcoming online appearances in celebration of Never Too Late's release, including some of the topics I'll be talking about and giveaways I'll be doing. Here's hoping the coming week is good to you all! While I'm over here hyperventilating, here is a little snippet for you. This week's snippet appears without context in the middle of Big Things, after a few Big Things have already happened. Enjoy! You are safe, and that is the most important thing. His words shot so directly to the target of her sorrow that fresh tears sprang to her eyes. His hand stroked tears away from the corners of her eyes. She answered his question with one of her own. “Such pretty words.” She would have scoffed if she had the energy. Today's edition of Saturday Snippets can be found at Limecello's A Little Bit Tart, A Little Bit Sweet blog. I'm at ALBTALBS doing a guest post (my very first). My topic? First kisses! So follow me to Limecello's wonderful site, where you can chat about first kisses (the magical and the...meh), catch a glimpse of the first time Honoria and Alex kiss, and get an opportunity to win a $10 Amazon gift card! It occurs to me that, with all my grading and drafting of Book 2 (tentatively entitled Always a Stranger) and preparing for the release of Never Too Late, it's been a while since I actually talked about anything Victorian. And I seem to recall promising in some previous post to discuss a few couples from the Victorian era who I find fascinating...and specifically the relationship between renowned Victorian poets Elizabeth Barrett Browning and Robert Browning. Before their relationship began, Elizabeth Barrett was already a talented and well-respected poet. Some early 20th century revisionist history emphasized her role as the wife who inspired the brilliance of poet Robert Browning, but she was always a literary power in her own right. And that is, in fact, one of the reasons their correspondence began--his admiration of her work. It might seem quaint now (or perhaps not, considering the rise of online dating and matchmaking), but their relationship began through the exchange of letters. (Volume 1 of their letters is available FREE for Kindle.) They corresponded for years before their relationship turned to marriage. And it's sort of wonderful to read their published letters, to see the admiration and respect and care they extend to each other as fellow writers and to see their acquaintance blossom and deepen through their writing. It's fairly clear that Robert Browning was enamored of Elizabeth Barrett to some degree from the beginning of their correspondence, and that's really just flat-out adorable, as is his clear desire to meet her and to be of assistance to her. Elizabeth's Sonnets from the Portuguese, published in 1850, was written before their marriage and was functionally a tremendous declaration of love--in all its complexity and self-doubt and revelation--from Elizabeth to Robert (and "Portuguese" was his pet name for her). How swoon-worthy is that, especially when you read the actual poems? Even after their marriage, both of them continued to write poetry--and write well! I think it's fair to say that neither seemed to sacrifice their talents for the relationship. In fact, some critics think that Robert's poetry was all the better for Elizabeth's influence.